Does this tape stuff really do anything? The proposed mechanism of action for this tape is a reduction of tissue (i.e. fascia, muscle, and/or tendon) stress (load) within a taped area. I’ll admit, I was skeptical, and admittedly still am hesitant to endorse this product. However, when I received my most recent issue of the Journal for the American College of Sports Medicine, one article of this issue, “Deloading tape reduces muscle stress at rest and during contraction” provides proof that deloading tape (KT tape, Rocktape, etc.) may be beneficial for relieving some strain applied to muscles. The article focused on applying the kinesiotape to the quadriceps (specifically the rectus femoris) while using supersonic shear imaging (SSI) to measure the amount of strain. The results demonstrated that a significant amount of strain was removed from the muscle when it was moderately to highly stretched, and when the muscle was contracted on the taped patients. However, muscles that are shortened showed no benefit from the deloading tape. The article stated that more studies need to be conducted, but I believe this is good preliminary evidence that these taping companies are marketing a beneficial product. I asked a few friends about their experiences with “Deloading tape” and I was able to get AVP Beach Volleyballer Aurora Davis to give me some feedback. 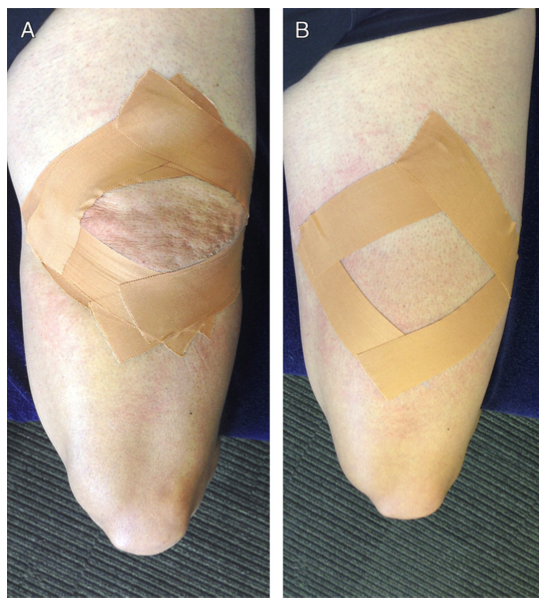 She used the tape for some knee pain that she was experiencing. I have seen various physical therapists, chiropractors, alternative medicine practitioners, and massage therapists using this technique. According to the study, the proper way to apply the tape is to make sure the skin over the area is bunched together in an “orange peel” appearance. The tape is meant to reduce the amount of strain in the effected muscle, so proper application is critical. This decrease in strain is used with the intention to facilitate injured muscles (strains or sprains), and help distribute load over a greater surface area. By decreasing the pull on the aforementioned injured muscle, there is lower risk in further injury. In theory, this sounds terrific. 1. Will deloading tape cause increase strain to muscles distal to the injured area and could this cause rupture or other strains? 2. This was a small group (n=13). 3. The group was healthy individuals. Comment below with your experiences of deloading tape! !